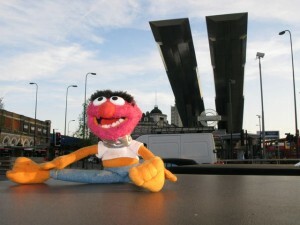 My name is Animal and I’m a Muppet. Most of you will remember me as the drummer on the show a few years back. I’m not playing drums any more, but I am a full time terrorist. Sorry, I mean tourist – bah, silly me! I heard that Klaus and Loris Matzka were having a few problems taking photographs in London, because a couple of over-zealous policemen decided that snapping the transport infrastucture was “strictly forbidden” and deleted their photos. 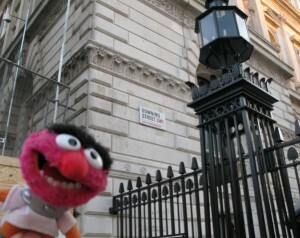 So I decided to help them out, go for a walk around London and take some pictures of my own. So if Klaus and Loris really are terrorists from the radical Peoples Front Of Austria (not to be confused with the Austrian Peoples Front – wankers), then I hope these photos prove useful! 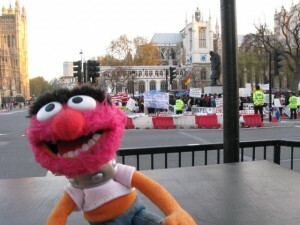 Then I went to a demonstration in Parliament square. Lots of angry people. 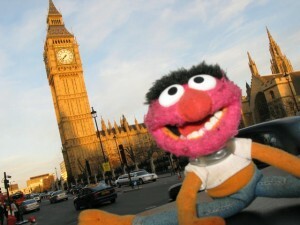 Big Ben - it's really big! 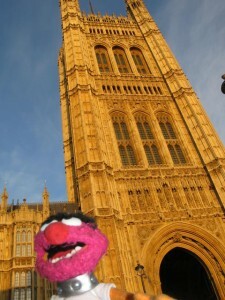 Parliament - the home of the British politburo. 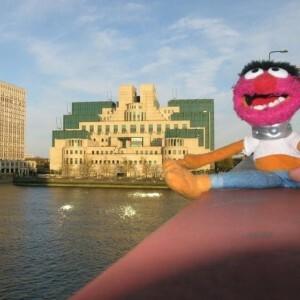 Apparently this building's full of Muppets! 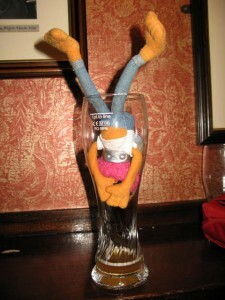 And finally - after a long day sightseeing, I went to the pub. 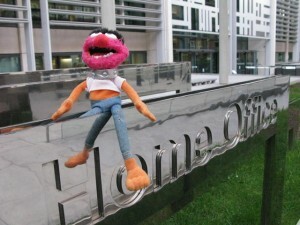 Firstly, I’d like to congratulate you on your first year in office. Even your most fervent of critics must be dining out on a large portion of humble pie. And it is on the subject of dining that I am writing, in particular breakfast. I invite you to join me for breakfast at my home in Hammersmith, where we can feast upon delicious home made pancakes, with fresh fruit and lashings of authentic Canadian maple syrup. All washed down with Borough Market’s finest fresh coffee. After breakfast, I would then like you to join me on my regular commute by bicycle to my workplace in Wells Street, just off Oxford Street. This journey will, I sincerely hope, demonstrate the absolutely woeful provisions for cyclists in West London. The highlights of the journey I shall now tempt you with. The coffee earlier consumed is of paramount importance at the start of the journey. You’ll need to be awake. We will cycle past the monolithic Westfield Centre with its three lanes of traffic and join the fearful Shepherd’s Bush roundabout. When the Westfield developers planned the new traffic routes, there was an attempt by local residents to get a cycle path installed across the middle on the roundabout, in order to provide them with a safe route across one of the busiest and most dangerous junctions in London. Sadly, the land belongs to Thames Water, and they just weren’t interested in lending this redundant land to the community. So, around the roundabout we’d go, dodging the myriad of cars, buses and lorries as they scream up towards the M41 motorway. Having successfully navigated the roundabout, we’d crawl up Holland Park Avenue and gingerly thread ourselves around the tightly packed traffic. This road is often blocked, so unless you want to fill up your lungs with the effluent of large diesel engines, we’d have to overtake and take our chances with the oncoming traffic. By the time we reach Notting Hill you’ll have worked up a good sweat – and the next part down Bayswater Road provides a welcome respite from gravity. And then the real fun starts: Lancaster Gate. This junction is a 4 lane semi-orbital in which you have to cross all lanes not just once, but twice before rejoining the road going East. In fact, this part of the journey is so dangerous that almost all cyclists use the pavement on the westbound part of the Bayswater Road, just north of Hyde Park. Now obviously I would never do something as evil as cycling on a pavement, so we’d dismount and walk the 200 metres to Victoria Gate where we can join the North Carriage Drive, just inside the park. There’s always plenty of Community Support Officers lying in wait with their charge sheets, should anyone attempt otherwise. and I guess she knows best about these matters. Just imagine the lure to even the most dedicated of tube users of commuting in this idyllic environment. So, finally, we enjoy the delights of Hyde Park itself, safe from congested traffic, fumes and over-exuberant special constables gathering £30 from all unsuspecting cyclists. Past Speaker’s Corner and over Park Lane, past the American Embassy surrounded by legions of machine-gun toting policemen, and onto Regents Street. The utopia of relative carefree cycling ends as we’d again muscle ourselves in between the buses and taxis. Here we’d play a great game called “avoid being squashed by the bendy-bus”. The incredulity you’d experience at their apparent willingness to overtake and immediately stop will by surpassed by their ability to block every lane of the carriageway, at the slightest hint of a corner or parked vehicle. We’d part company towards Wells Street, which would be my destination and I would thank you for enduring this ordeal with me. Or perhaps you would stay to watch my futile attempts to find somewhere to lock the bike, which you’d likely find highly amusing. You’d then have the unenviable prospect of navigating your way down to City Hall to your own workplace. Perhaps one day I will join you, just to see how I could get myself killed in a different part of London. In case you don’t have time to join me for breakfast and the subsequent adventure, I sincerely hope that you will appreciate that the provisions for cycling in London are embarrassing at best, and lethal at worst. Personally, I would hope that the Mayor of London would have it in his or her power to finally get to grips with this situation and actually get some decent cycle lanes built. Paris managed it along with their wonderful Velib system, so why in heaven’s name can’t London? When the Olympics come in 2012, all visitors would clearly understand why we have a world class cycling team – because the only place we can safely cycle is within the confines of a velodrome. I very much look forward to you joining me for breakfast. You are currently browsing the innerhippy blog archives for April, 2009.